Zandra and Jeremy exchanged their wedding vows on October 9, 2010 in an outdoor ceremony on the grounds of Holland Gardens Banquet Hall. The weather cooperated fully and the gazebo and the waterfall were perfect for creating beautiful formal wedding portraits and ceremony images. The reception was held indoors in the banquet hall where the elegant Red, White and Black theme was carried throughout the evening. John from Sounds of Music DJ’s provided the evening’s entertainment. Congratulations Zandra and Jeremy. 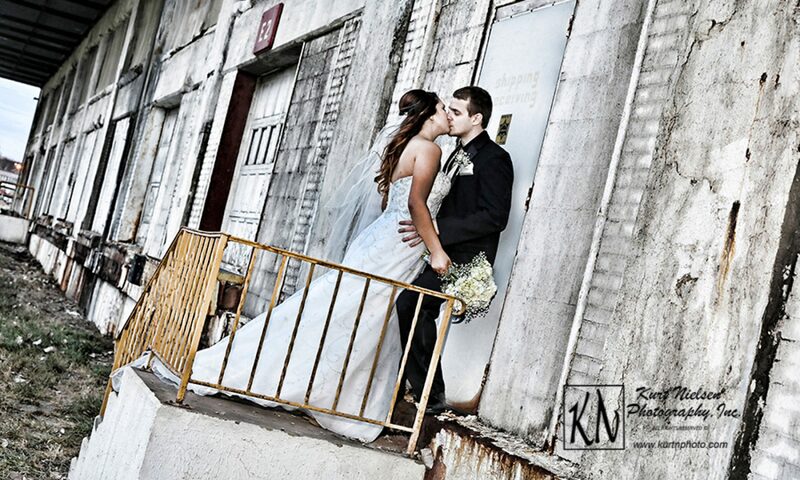 Thank you for trusting Kurt Nielsen Photography to capture the intimate moments on your special day! May you forever live…. Here are just a few of the images from Ryan and Valerie’s engagement session! Ryan and his family have been coming to Kurt Nielsen Photography for many years and I was honored when Ryan asked me to do their engagement photos! I can’t wait to photography their wedding in August! Heather and Ed exchanged their wedding vows in an outdoor ceremony at Ed’s family farm in Michigan on October 2, 2010. The cold and the rain did not stop the fun! The older barn on the property made for a great backdrop for some of the formal portraits. After the ceremony, the wedding party took a trolley to The Rail Bar and Grill in Petersburg, MI, where Ed works part time, so they could enjoy a drink and relax. Then they went back to Ed’s family farm where the guests enjoyed a pig roast reception! The beautiful flowers for the ceremony and reception were provided by Prescott Florist. The wedding cake was from Thrush’s Pastry Shoppe. John from Sounds of Music provided the music for the couple’s first dance and for the guests to dance the night away. Heather’s family has been customers of mine for years, and I even photographed her senior portraits. I was honored to be a part of her big day and to capture the couple’s wedding memories. Congratulations Heather and Ed! May you have many, many years of wedded bliss!